My first experience with a lobster mushroom (Hypomyces lactifluorum) was about a year and a half ago, eating a good-bye dinner with friends at Sitka & Spruce, an underground foodie restaurant in Seattle. I guess it’s not so underground anymore but the concepts of farm to fork, local, seasonal and sustainable are echoed in every detail of that restaurant and their daily changing menu. I was very impressed that they easily (and deliciously) did an impromptu 5 course vegetarian family style dinner for us. And I met the lobster mushroom. They served it with vermicelli and a delicate sauce (of which I don’t remember). The mushrooms stood out. I almost called the server back to the table because it looked like lobster meat and had the same texture and flavor of lobster meat. I was assured that they were locally foraged, hand-picked lobster mushrooms. I was never a fan of lobster growing up, only if I bathed it in butter. At that point I was just eating butter with something to chew. But I’m not against a meaty, earthy taste and immediately loved the mushrooms (once I knew it wasn’t a crustacean). 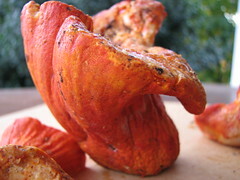 Occasionally I’ll see fresh lobster mushrooms at farmer’s markets or specialty grocery stores (for outrageous prices). But the ones in the store are old, dried and decaying. I’ve been finding more and more in the woods lately on various hikes and foraging expeditions for chanterelles and it’s really exciting to find them. They are bright orange and easy to spot on the forest floor (usually they are peeking out under the leaves). There aren’t any lookalikes for this mushroom, but it is important to make sure it’s the right kind of lobster, because it really isn’t a mushroom after all. It is a parasitic mold that takes over other wild mushrooms. If you cut it open, you don’t see the other mushroom inside. All of the old mushroom’s tissues have been turned to “lobster.” I think it’s fascinating. 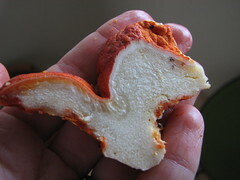 Luckily for the forager, the lobster fungus is edible. The scary part is if the lobster is growing on a toxic mushroom, thus bad news for belly or worse. My readings have instructed me that the bright red lobster mushroom is selective and only grows on specific Russula or Lactarius mushrooms (both edible). I can’t find any info about look alikes to the lobster, it seems pretty unique. There is a lobster-like mold that takes over toxic mushrooms, but the photos I’ve seen it looks nothing like the classic lobster mushroom. So I will not worry and be sure to cook it for at least 15 minutes before enjoying it. I’ve had lobster mushrooms in meals over the past two weeks with no sick feelings, so I will trust the experts. What to eat it with? Since it’s meaty and sort of fishy, simple pasta dishes are nice, as are sautees with garlic and olive oil. You could also marinate it and grill it, which sounds awesome. I made a risotto with them and chanterelles and that was a nice welcome dish for fall. They are about $10/lb at my local grocery store if you are too scared to forage for them. I am so completely enthralled with this blog. The Lobster Mushroom sounds fascinating! It has rendered me speechless. I have never seen or heard of this fungi EVER! I so badly want to try some. ditto… are you going to start foraging workshops soon?? Down here in S.CA??? Jeni: I’m glad you’re enjoying my blog. I don’t know if Lobster mushrooms grow in Espana. I know you can buy them dried, but it may not be the same. Come visit! They are in their peak right now. Traci: Probably not in SoCal, since I don’t know the woods very well there. I’m just learning them here in Oregon. Sounds like a good idea, a travelling foraging workshop. I’d need to learn a LOT more first.